CHICAGO (FinalCall.com) - Less than a week after a Gaza bound aid-convoy, the Freedom Flotilla, was raided by Israeli naval commandoes resulting in the death of several humanitarian workers, including one American, another international standoff looms as another ship headed to the region. That ship departed Ireland and was seized by Israel on June 5. The Freedom Flotilla consisted of a fleet of nine ships sponsored by several aid organizations. The sea-bound convoy originated in Turkey. A week of angry protests and demonstrations across the globe have many analysts wondering if the international condemnation is enough to bring an end to the Israeli blockade which prevents the delivery of essential goods to the suffering people of Gaza. 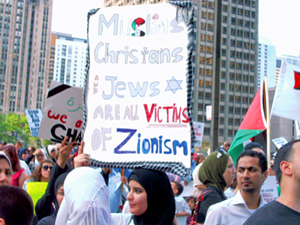 “I think there is a sickness in this country that prevents us from having an honest conversation about Israel,” said author and prominent Palestinian activist Ali Abunimah standing just outside of the Israeli Consulate in downtown Chicago after a rally on June 1 that drew thousands. “Those who do want to talk about it are demonized and attacked, called radicals or terrorists. People who just want to have an honest conversation about innocent people being killed,” he told The Final Call. Mr. Abunimah said the passengers aboard the Mavi Marmara—the largest ship of the convoy attacked on May 31—were justified in defending themselves given the fact that the raid took place in the pre-dawn hours of the morning. According to organizers for the Freedom Flotilla, over 10,000 tons of valuable materials were on board making it an enticing target for pirates. Important questions are being raised regarding the amount of aid given to Israel despite the stringent belt-tightening measures encouraged by the Obama administration during a time when states across America are experiencing severe financial challenges. “If Israel is threatened by unarmed, humanitarian activists to the point of massacring them, then Israel is a failed state,” wrote former U.S. Congresswoman Cynthia McKinney in an Op-Ed that appeared on internet blogs and news sites worldwide. “U.S. 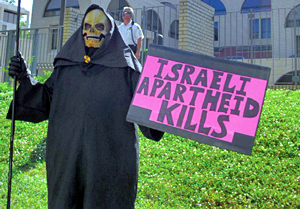 President Barack Obama's most recent granting of an additional $205 million for Israeli ‘missile defense' is unconscionable, when in the same week, reports revealed for the first time, Israel's offer of nuclear weapons to apartheid South Africa,” she added. According to statistics provided by the advocacy group, American Muslims for Palestine taken from the CSR Report for Congress titled “U.S. Foreign Aid to Israel,” in the fiscal year 2008, the U.S. gave Israel $2.4 billion in foreign military funds, $40 million was given to Israel to help 11,500 Jewish immigrants move to Israel to settle there. The amount of U.S. military aid to Israel will be increased incrementally from August 2007 to 2018 by a total of $6 billion, meaning there are already budget provisions made for aid to Israel for the next 7 or 8 years. A report released by the Center on Budget and Policy Priorities said 46 states have or are facing large budget shortfalls. In fact, financial analysts with the center estimate that states will have to deal with total budget shortfalls of nearly $260 billion for 2011 and 2012. California, the most populous state in the U.S. recently faced insolvency almost declaring bankruptcy, and the city of Detroit, formerly an economic powerhouse sustained by a strong American auto industry, faces the possibility of a nearly $460 million deficit to its $1.6 billion budget. This would result in the city possibly falling into state receivership with the threat of bankruptcy looming. Federal aid provided by the American Recovery and Reinvestment Act has almost run out, and critics claim much of the money failed to reach urban areas in terrible need of development. Municipal governments are using every idea possible to generate funds—most often opting for tax increases—and state budgets are stretched, yet, the federal government seemingly has no problem consistently delivering billions of dollars in aid to Israel. Thaer Ahmad, 21, believes the money is being improperly used. He was supposed to be a traveler on the Freedom Flotilla aid convoy attacked on May 31, however, he broke his ankle, which prevented him from going. He said he was kind of naïve and lacked a full grasp of what was going on in Gaza until he visited the region in the summer of 2009. Mr. Ahmad said after his second visit to the region in December of 2009, he reached the conclusion that the American politicians were being dishonest in their treatment of the Palestinians, and ignoring those experiencing discrimination in America. With the federal debt hovering at around $13 trillion and growing, and unemployment rates for Blacks nearly double the national average, he believes the money can be used better elsewhere. Mr. Ahmad, invoking the name and memory of Malcolm X, said what happens in Chicago and Harlem is similar to what goes on in Gaza and the struggles are related. Many activists at the protest mentioned the 1967 Israeli attack on the USS Liberty, an American ship in which 34 Naval shipmen were killed and 171 injured when the Israeli Air Force bombed the ship, also in international waters just north of the Sinai Peninsula. They believe the one-sided American policy related to Israel is the main threat to peace in the Middle East, and the primary obstacle to establishing an American society free from threat of terrorism. “The shocking thing is that when any other government attacks American citizens anywhere in the world, the United States stands with its citizens. When Israel alone attacks Americans, the United States stands with Israel. The U.S. government is being more loyal to Israel than to its own citizens, and that is something that should wake Americans up,” said Mr. Abunimah.